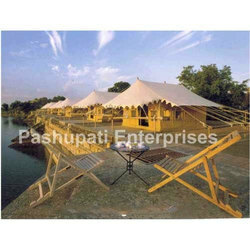 We are engaged in offering a wide range of Cottage Tents which is easy to carry and requires less maintenance. These are widely used in resorts, hotels, lodges, farm houses & base camps and are available in the multitudes of colors & patterns. These can withstand any kind of weather conditions, be it very hot or extreme cold. 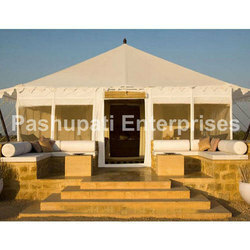 These are also offered at a very competitive price range without any compromise in its quality. This Product is manufactured from Finest quality fabric suitable for All weather conditions. Outerfly can be made from Guaranteed Waterproof fabrics from Cotton Canvas to PV blended Canvas to PVC Coated Canvas. Tent can be made to be compatible with Air-conditioning Toilet Rooms are covered with Extra layer of Nylon fabric for Stain free & Odour free room. This Product is manufactured from Finest quality fabric suitable for All weather conditions. Outerfly can be made from Gauranteed Waterproof fabrics from Cotton Canvas to PV blended Canvas to PVC Coated Canvas. Colour options are also available. Tent can be made to be compatible with Air-conditioning Toilet Rooms are covered with Extra layer of Nylon fabric for Stain free & Odour free room. This Product is manufactured from Finest quality fabric suitable for All weather conditions. Outerfly can be made from Gauranteed Waterproof fabrics from Cotton Canvas to PV blended Canvas to PVC Coated Canvas. 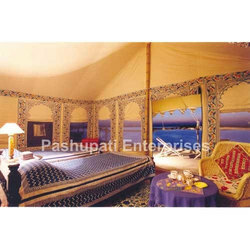 Tent can be made to be compatible with Air-conditioning Toilet Rooms are covered with Extra layer of Nylon fabric for Stain free & Odour free room.